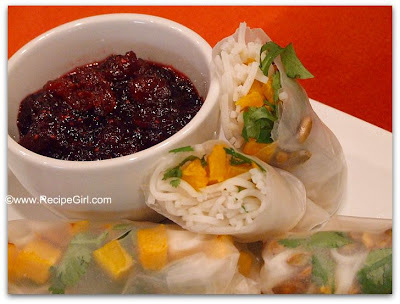 My first foray into a knowingly “vegan” recipe was something that caught my eye and inspired me to pick up Veganomicon on a whim: Butternut Squash & Pumpkin Seed Rice Paper Rolls with Cranberry Chile Dipping Sauce. 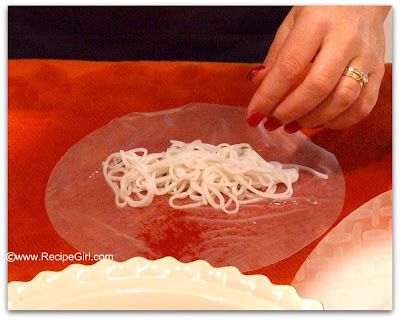 I’ve enjoyed many a spring roll, but never had made them myself. 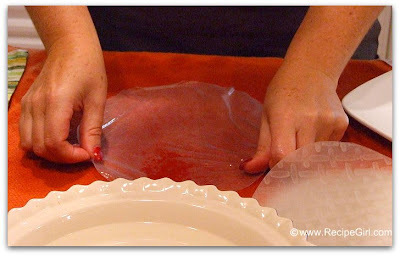 They’re incredibly easy- just have all of the ingredients ready to go in assembly-line fashion. 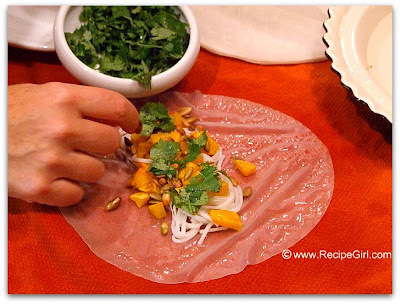 Going into this spring roll: Rice noodles, roasted butternut squash, roasted pumpkin seeds and chopped fresh cilantro. 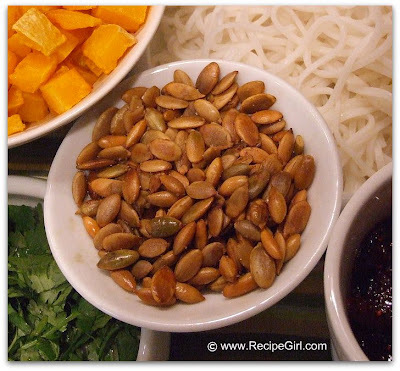 The sauce recipe given for this appetizer was a soy dipping sauce, but they also suggested a cranberry chile sauce that I thought would be wonderful to try with the butternut squash (especially it being Thanksgiving week and all). These spring rolls were awesome. The cranberry dipping sauce was a very good call. After the first bite, my husband said, “These are good.” After the second bite he said, “Yeah, these are really good.” I ended up eating so many of them that I didn’t want the stir-fry that I had made for dinner. 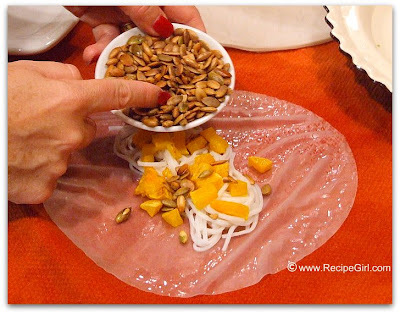 The butternut/pumpkin seed choice was very different for a spring roll filling, but seasonally appropriate and unique. The butternut squash is lightly caramelized, imparting that delicious flavor, and the pumpkin seeds add earthiness and crunch. Terrific. 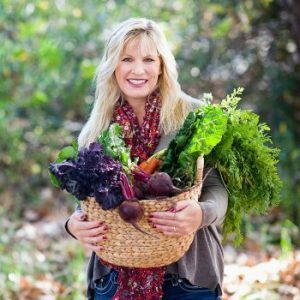 This blog is not going Vegan. 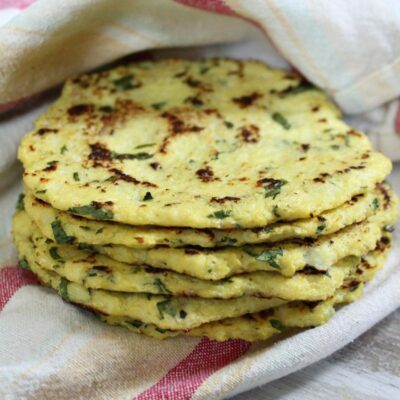 But this recipe is proof that those Vegan’s do eat some good stuff! OMG!! These look amazing!! Why have we not ever thought about using butternut squash? 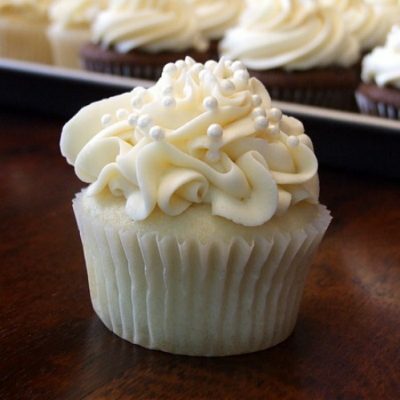 I just LOVE your step by step photographs and your beautiful recipe. 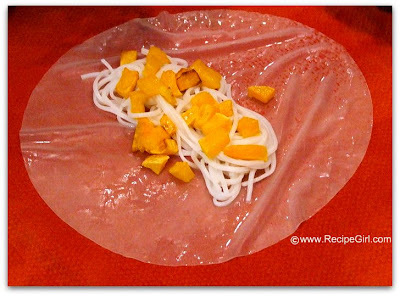 It’s so inspiring to see all the creativity that can go into a springroll! Hail to you! I bet there’s gonna be lots more springrolls in your very near future! 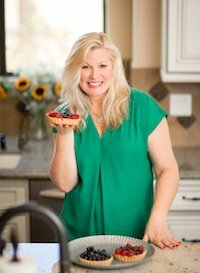 Your comment about this blog not going vegan cracked me up. These look good. 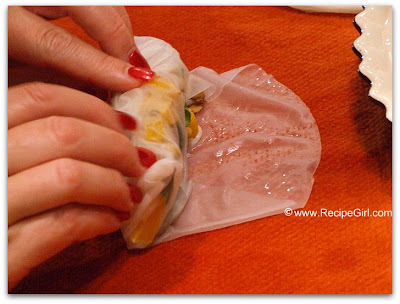 Summer rolls are yummy and mostly easy, I agree, but boy I find the rice paper to be frustrating sometimes!